Ever since the Sugar Hill Gang name-dropped the Lincoln Continental in "Rapper’s Delight", the automobile has played a major role in the hip-hop culture. On the West coast, a burgeoning lowrider scene sparked a new found passion for American car manufacturers such as Cadillac, Chevy, and Oldsmobile, while rap crews from the same area rapped about customizing these cars for show-and-tell. Their East coast counterparts opted for the more luxurious foreign vehicles such as BMW, Lexus, and Benz after taking notes from the larger-than-life mafioso drug dealer characters often sprinkled in their rhymes. As time moved on, these vehicles, much like hip-hop itself, grew even more extravagant and excessive—reaching record-breaking speeds and price tags bigger than most homes. 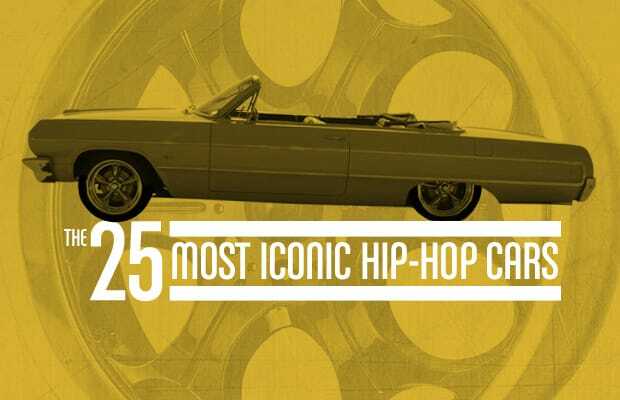 From the coast to coast, from the south to the mid-west, spanning 30-plus years, we cover the top 25 cars that have had an impact on hip-hop music and vice versa.